﻿ New or used 125s: What should a young new rider buy? 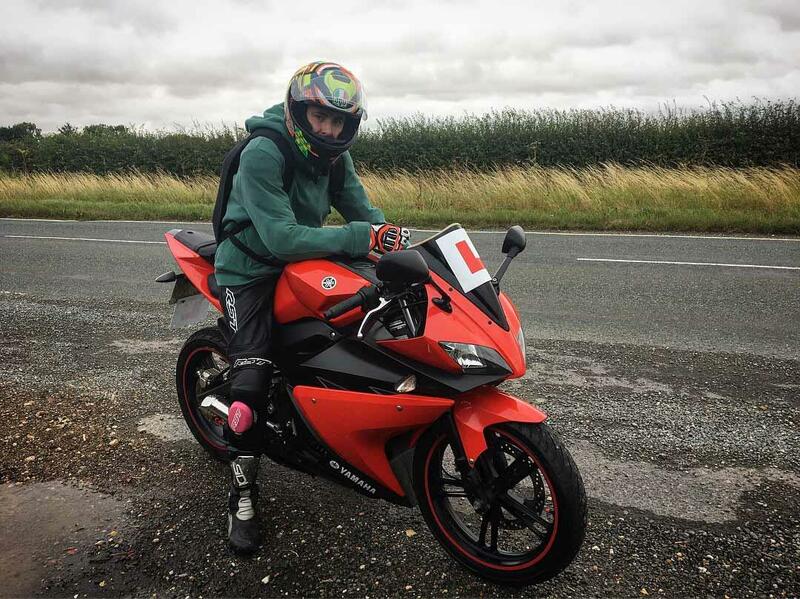 After the transformation of the UK motorcycle licencing structure in early 2014, the 125 class has arguably never been more relevant to the budding teenage biker. Gone are the days of 33bhp restrictor kits from the age of 17 for any machine you could afford and in its place comes a maximum of just 15bhp and an engine capacity of 125cc until 19-years-old - regardless of whether you pass your A1 licence, or remain on L-plates after completing your Compulsory Basic Training. This then means two years on a small-capacity motorcycle, which is also more than likely your only mode of transport at such a young age. Thankfully, the 125 market is currently saturated with bikes and scooters of all genres, able to cater for the vast majority of budgets. However, despite a plethora of used machines available on MCN Bikes For Sale, are you actually better placed to purchase a cheaper brand-new machine through a dealer network with some form of warranty, than you are saving money in the short-term and going for something used? To find out, MCN enlisted the help of Rieju's sporty £3799 RS3. 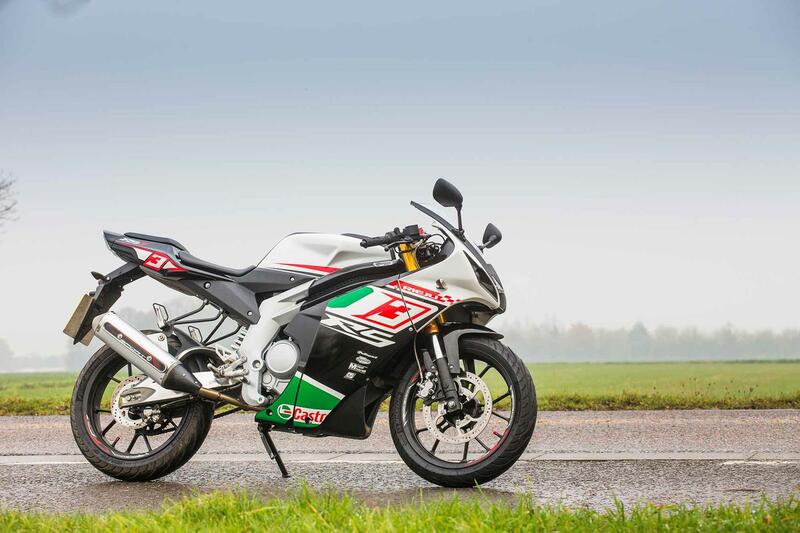 Designed to rival the likes of the £4099 Suzuki GSX-R125, £4699 now four-stroke Aprilia RS125 and £4449 KTM RC125, the Spanish RS3 offers a similar degree of performance and air of quality, only with a slightly smaller price-tag. 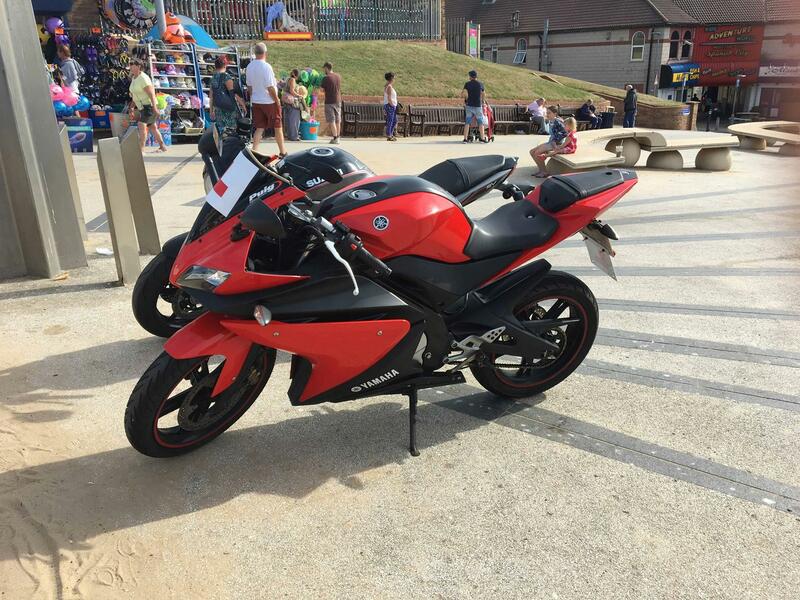 This was then put up against an eight-year-old Yamaha YZF-R125, purchased by 17-year-old MCN reader Matt Sutherland for just £1700 in July of this year. Complete with a handful of modifications any 17-year-old would want, such as a boisterous full Scorpion exhaust system, it offers all of the bling, for under half the price of the brand-new Rieju. Powered by the same liquid-cooled single-cylinder four-stroke as the older Yamaha YZF-R125 it’s going up against, the carbureted Rieju is sadly a victim of Euro4 legislation and will soon no be available brand-new, due to emissions regulations and a lack of either ABS or linked brakes. That said, whilst still available, the RS3 should be on everyone’s 125 short-list, thanks to its bang-for-your-buck package including quality components like upside down Showa forks and rear shock with remote pre-load adjustment and a set of grippy Michelin Pilot Street tyres. This is a bike that would suit smaller riders far more so than a taller pilot, due to its cramped, sporting nature. Hunched over the bars with nothing but your shoulders and elbows visible in the mirrors, it begins to becomes uncomfortable after around 70 miles – made worse by the thinly padded seat and high pegs, which can limit lower body movement on the bike when wearing multiple layers. 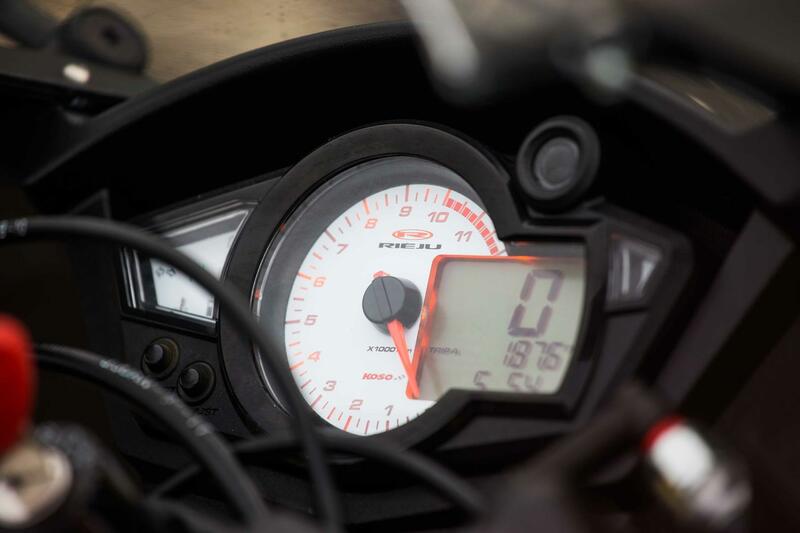 Sitting directly in front of you is the tiny clock unit, which mixes an analogue rev-counter with a digital display housing details like your speed, trip and overall distance travelled. Unfortunately, this was largely irrelevant during this test, thanks to the rider being unable to swap the dash from kmh to mph. What’s more, the dash would also periodically display either a fuel (there’s no gauge) or oil warning light despite both being filled to an appropriate level. The fuel light would also flick on when riding up larger hills with around half a tank still sloshing inside the machine. Another quirk that soon becomes tiring is the clunky gearbox, which often fails to jump from first to second and also hops out of sixth, back to fifth under hard acceleration. Bringing the RS3 to an abrupt halt is a single two-piston caliper, biting a 280mm disc and powered by a single braided line. 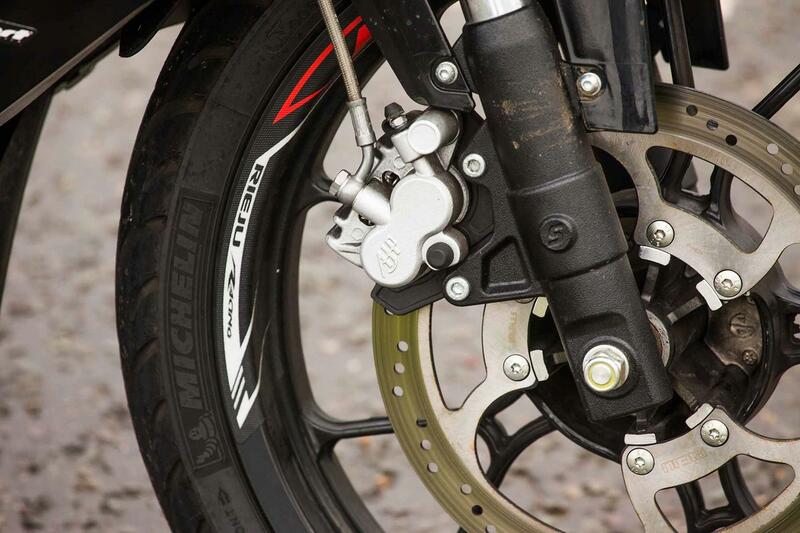 As there is no desire for the bike to pass Euro4, neither ABS or a linked braking system have been installed – something available on all of Japanese and European competition. That said, the bike will stop quickly with a commanding dive from the front end, with the upside down non-adjustable Showa forks sometimes feeling too underdamped to cope with the bike’s braking forces. The rear disc brake also offers plenty of power, with the rear locking up with almost any level of application below 15mph. Although great fun, this could catch out some new riders. This braking force is improved by the OE Michelin Pilot Street tyres, which grip the road excellently and inspire real confidence when the going gets twisty - despite the adverse wintery conditions on the day. Away from the critique of how this bike stops, goes, handles and behaves, for many would-be owners this is likely to be the only bike they have ridden long-term and, as such, looks play a huge part in the final decision in what to purchase. The Rieju RS3 ticks this box perfectly. With a front end reminiscent of the Energica Ego electric superbike and a sleek rear-end, it offers contemporary sporty styling for a less than premium price-tag. No sooner had I sat on the Yamaha YZF-R125 had I remembered why I made it MCN’s 2018 sports 125 group test winner earlier this year. Offering a sporty, yet comfortable riding position, it feels practical without being upright and the lower foot pegs allow for more leg room for the taller rider. It also feels like a bigger bike, thanks to wider-set bars and the 1.8-litre larger fuel tank between your legs. With a large analogue rev counter climbing up to a 10,000rpm redline, off-set to the right of a digital display housing a fuel gauge, speed and trip, it out-guns the brand-new RS3 for dashboard features, despite being almost nine years older. Unfortunately, on this particular machine, the fuel gauge reads a constant full, regardless of how much is in the tank, leaving owner Matt to rely on his trip and sloshing the bike from side to side to work out how much fuel he has remaining. Although probably nothing more than a sensor acting up, it’s a repair that some young riders may be unable to afford, that could be covered by a dealer warranty on a brand-new bike. Another repair desperately needed is the side-stand cut-out switch, which has failed on this example and could put you at risk of crashing almost as soon as you’ve pulled away. You must also factor in the part-worn tyres on a used machine, with some riders scrimping on costs with cheaper rubber that could impact on the bike’s behavior in the poorer weather. 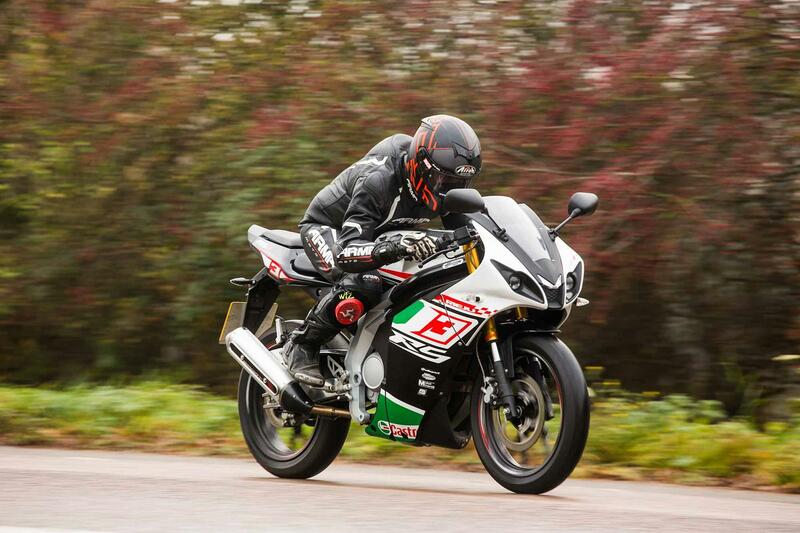 Fortunately, this machine has been fitted with Pirelli Angel GTs, which give plenty of feedback and longevity - perfect for a rider forced to used their motorcycle in all conditions. Less fortunate is the squared-off rear tyre on this one that makes the bikes' handling feel lazy and slows the direction change, which is something you really miss on nadgery country roads. Winding on the power from idle is so much more of an event on the Yamaha, thanks to a throaty soundtrack provided by the full Scorpion exhaust system. Exiting below your right foot, you can’t help but be immersed in the noise, which replicates an angry Moto3 bike perfectly. Throttle action is also nicer on the Yamaha, thanks to less travel from zero to full gas - complemented by the chunky Oxford heated grips that keep your hands nice and toasty. An all-black double-bubble screen also means next to no wind blast at any speed, meaning less fatigue when riding. Despite being eight years older than the Rieju RS3, the used Yamaha has proved to be plenty of bike for plenty of people, despite being under half the price-tag of the new machine. In some areas, the Yamaha has it licked and will actually out-perform the Rieju in areas like mid-range performance, noise and riding position, however loses out to the newer bike in others due to electrical gremlins causing faults to the fuel gauge and side stand switch. 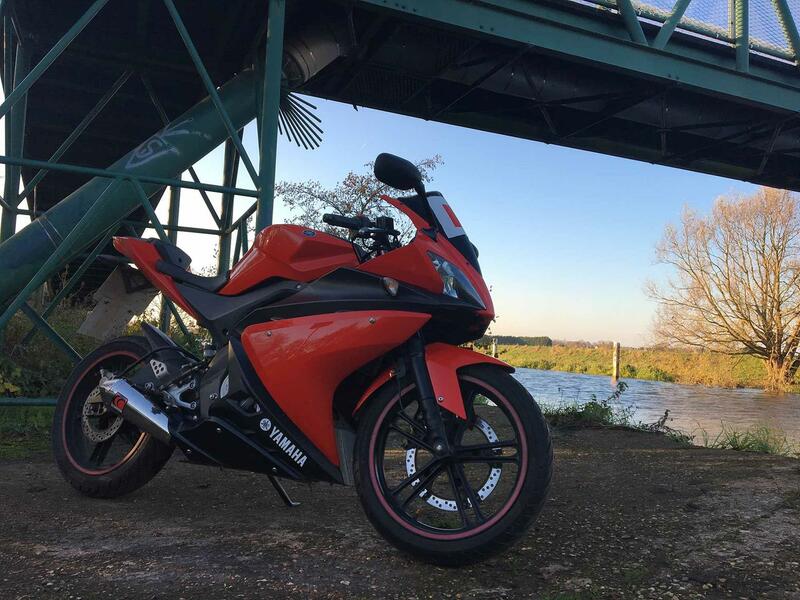 The YZF-R125 is just one of many used bikes that you could find on MCN Bikes For Sale today and - for reader Matt - it has served as a viable alternative to a new machine. However, for reliability, spec from standard and dealer warranty you cannot beat the new machine. Whichever you choose, make sure you use MCN Bikes For Sale to buy it.